Shaker Wahib al-Fahdawi al-Dulaimi (1986 – May 6, 2016), better known as Abu Waheeb ("Father of the Generous"; Arabic: أبو وهيب), was a leader of the militant group Islamic State in Iraq and the Levant in Anbar, Iraq. He was known for the execution of three Syrian Alawite truck drivers in Iraq in the summer of 2013, as head of the Al Anbar Lions. He and three others were killed in a United States-led coalition airstrike in May 2016, according to the US Department of Defense. Fahdawi was born in 1986. In 2006, while studying computer science at the University of Anbar, he was arrested by US forces on charges of belonging to Al-Qaeda in Iraq. Following his arrest Fahdawi was detained by US forces at the Camp Bucca detention facility in southern Iraq until 2009, when he was sentenced to death and moved to Tikrit Central Prison in Saladin Province. Fahdawi was one of 110 detainees who escaped the prison in 2012, following a riot and an attack by forces from the Islamic State of Iraq. He had learnt from the senior ISIS leaders he had been imprisoned with, and he became a field commander in Anbar province after his release. Iraqi officials blamed him for a long list of terror-related offences and put a $50,000 bounty on him. By 2014, Fahdawi was playing an important role in leading combat operations of the group, now know as Islamic State in Iraq and the Levant, in Anbar. 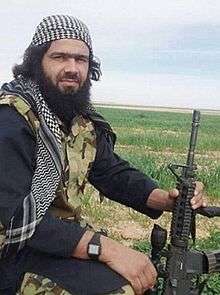 On 6 May 2016, the Pentagon said Abu Waheeb was killed along with three others in a vehicle by a US airstrike that targeted an ISIS gathering in the center of Rutba. However, after some time pro-IS accounts released photos of Abu Waheeb claiming he was still alive. Pro ISIL accounts claimed that these were recent photos of Abu Waheeb, thus refuting the claim of US coalition. ↑ "The Rising Star of the Islamic State (ISIS) : Sunni Terrorist Abu Wahib Shakir al-Fahdawi leader of Ussud Al-Anbar Brigade". 1 2 3 4 Abbas, Mushreq (15 January 2014). "Has al-Qaeda found Zarqawi's successor?". Al Monitor. 1 2 3 "Bare-faced killer rises to fore of Iraq militancy". Gulf Times. 28 August 2013. ↑ "US airstrike kills ISIS 'Emir of Anbar Province' in Iraq | Fox News". Fox News. 9 May 2016. Retrieved 9 May 2016. 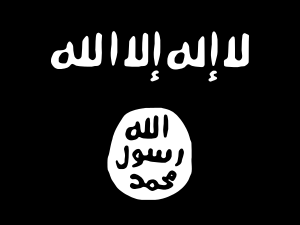 ↑ "Senior Islamic State official in Iraq killed in air strike: Pentagon". Reuters. 9 May 2016. Retrieved 9 May 2016. ↑ "ISIS leader for Iraq's Anbar province killed in airstrike: Pentagon". Retrieved 9 May 2016. ↑ "Al Qaeda Is Taking Over Whole Cities in Iraq". VICE News. 16 January 2014. 1 2 "Islamic State leader in Iraq's Anbar killed, Pentagon says". BBC News. ↑ "Notorious Islamic State leader killed in airstrike, Pentagon says". The Washington Post. 9 May 2016. ↑ "IS Governor of Anbar killed in Airstrike". ↑ "Pulse shooter Omar Mateen told police to stop bombs in Iraq, Syria"